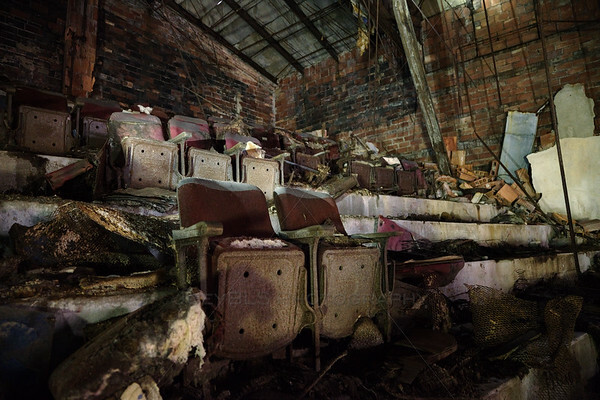 The long abandon Palace Theater in Gary, Indiana still has some of its seats remaining. These seats are located in the balcony, an ever dangerous place to explore. This theater is a local hotspot for urban exploration and urbex photographers who come to Gary photographing the many abandon buildings across town. Palace Theater Balcony Seats by Joey B. Lax-Salinas is licensed under a Creative Commons Attribution-NonCommercial-NoDerivs 3.0 Unported License. Permissions beyond the scope of this license may be available at http://www.joeyblsphotography.com.